When it comes to exercise mats, the Viavito Tri-Fold exercise mat with handles is hard to beat. Ideally suited to a wide variety of cardio, stretching, flexibility and resistance exercises such as crunches, sit-ups, press-ups and lunges, and others for which you need to lie down or be on hands and knees. 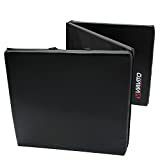 This long-lasting, hard-wearing mat is extremely practical thanks to its carry handles and its tri-fold design which make storing, carrying or transporting it effortless. Made from 3cm (1.2″) thick polyfoam material for added comfort and support. Also featuring a heavy-duty vinyl coating for increased durability and easy cleaning, this mat is a must-have piece of kit for anyone who regularly does floor exercises.